The San Francisco Giants are now a perfect 13-0 in the last 13 times that Barry Zito has taken the ball, including two starts in the playoffs. Some of those starts have not been pretty—twice he did not see the end of the third inning—but the end result is what matters. 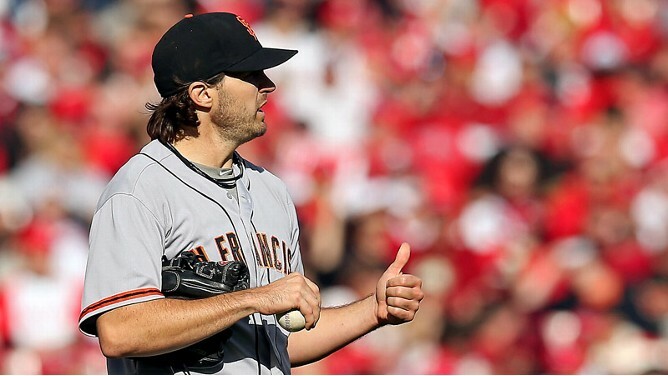 And in Game 5, as he did in the previous 12 starts, Zito led the Giants to a win. Let there be absolutely no mistake: the past couple months (and the season as a whole) have seen some of the most bizarre, unexpected events for the Giants. Starting pitching has been the crux of the organization ever since they won the 2010 World Series. Everybody except Barry Zito has faulted at some point during Zito’s winning streak and that includes a former two-time Cy Young Award winner and a right-hander who threw a perfect game. At the start of the season Brian Wilson went down and a successful return from injury by Posey was anything but guaranteed. Posey has become the face of the franchise and is now the likely National League MVP. Melky Cabrera, a juiced-up hitting machine, helped lead a Giants offense that has been at least as critical to the success of their team as the pitching. San Francisco concluded the 2012 regular season top-five in all of baseball in batting average at nearly .270. Three years ago the Giants had two players above .265 (among qualifiers). Bruce Bochy deserves a large amount of credit for the work that he has done as manager with an erratic organization. San Francisco has often defied who they have defined themselves as over the course of the past couple years. He should be manager of the year (even considering the incredible work of rookie manager Mike Matheny of the St. Louis Cardinals), but an incredible amount of accolades deserves to fall with Barry Zito. What he has given the Giants this year has been quintessential to their success. His contributions arguably equate to Buster Posey’s incredible comeback. Nonetheless, he kept his head down and continued plugging away—which is exactly what the Giants have been doing over these 2012 playoffs. Sometimes it has been downright ugly, but Zito (like the Giants) have not given up. And it bears repeating a second time: the man has led the Giants to wins every single of his past 13 starts. Sometimes it’s better to be lucky than good, and Zito has had his fair share of luck…but being perfect is a completely different story. You ride that as long as you can. And while I disagreed with Bochy giving Lincecum the Game 4 start in the NLCS, giving Zito the ball in Game 5 proved to be season-saving. Sometimes luck and hard work have a funny way of coinciding and discerning the two should not really matter. In Game 5, Zito had all of his pitches working. He threw perfect “Zito ball.” He made an 86 MPH fastball look like it was 96 by commanding both sides of the plate with his infamous curveball and excellent changeup. But the numbers that Zito put up were not what impressed me most. Manager Bruce Bochy gave the ball to him in a situation that Zito has failed miserably in in the past. Clutch was a gene that had apparently escaped him. Even the great Joe Buck remembers that Zito was left off of the playoff roster in 2010. That was a move added insult to injury but Zito sucked it up and went with the flow. This time he got his chance and threw lights out. He pulled himself out of a second inning jam and got some help from Pablo Sandoval and Hunter Pence on defense. It was somewhat surreal, but he was cool for the 7 2/3 innings that he pitched. He accomplished something that probably nobody else on the Giants pitching staff could do. He knows the pain that he has caused Giants fans over the years, something that probably was not really his fault. Outrageous expectations in the form of dollar signs were met with hard reality and Zito was the recipient of a lot of harsh criticism (myself very much included). But as a Giants fan I recognize and appreciate that Zito has powered through it despite that the circumstances and criticism—and this performance in the NLCS against a high-octane offense was spectacular. He weathered the storm and has been the representation of a “never-say-die” attitude. He has provided the postseason magic that the Giants desperately needed. While there may be no way to quantify it, the Giants do seem to play harder behind Zito. His constant effort edges them on—maybe because he does so perfectly represent what their team has been about over this season. Resilience has often been the only thing that the Giants could look for when they were underperforming and it led them to completing a historic comeback in the NLDS. Zito acknowledged that the Giants still have their work cut out for them. San Francisco is still down three games to two against the Cardinals heading back to city by the bay. It truly does come down to this: World Series or go home. Fittingly, it represents the dichotomous nature of Zito’s pitching: either come through in the clutch or pack your bags and hope something changes next year.